Suddenly people started shouting "Stop! Stop!" and I could hear a rapid crunching/popping noise. Turning round I saw an articulated lorry, driving toward the bridge. On her back, knees bent and feet on the front bumper, was a lady who was being pushed along the ground by the lorry - her bike was just going under the front wheel which was the crunching/popping noise. The driver was looking around him at all these people shouting "Stop! Stop!" and shrugging - his reaction was "they cannot be shouting at me", so he kept going. It was probably all over in seconds, but it seemed to be a long time before he finally decided that the people (including myself) who were waving/pointing at him, the lady and shouting, did mean that he should stop. The lady cyclist probably got pushed 2-4 metres, hard for me to judge and I'm wary of exaggerating. When he stopped lots of people rushed over and escorted the lady to the side of the road, she was fine, just shocked, she said that she thought she had made eye contact with the driver at the lights, but then he'd just driven straight into her/over her bike. She then went to sit down on some steps as a PCSO ran over. The truck driver was out of his cab by now, and circling his vehicle taking photographs. Not once did he approach the cyclist, didn't speak to her at all- he must have taken from her ability to walk that she was ok.
Maybe he is under orders not to apologise for accidents lest it be taken as an admission of fault, but still- if the cyclist had not had the presence of mind (amazing, under the circumstances) to get her feet on the bumper the driver would have been standing there having killed her. So it's happened again, another female cyclist in a miraculous lorry escape. On 11 July a woman went under a lorry, with her bike crushed, on New Bridge Street, Blackfriars, but escaped almost unharmed. The lorry crossed her path turning left into Queen Victoria Street. I recall seeing a photo of that incident as well but can't find it now. In that case I think the woman got trapped under the high part of the lorry trailer and got out before her bike went under the back wheels. Min Joo Lee, a 24-year-old fashion student from Korea, was pronounced dead at the scene after the incident at 11.40am on Monday. She is the third cyclist in five years to die at the junction, which joins Euston Road, Pentonville Road and York Way. The driver of the heavy goods vehicle, a man in his 60s, was treated for shock at hospital. The woman is believed to have become caught under the wheels of the truck. Dr Odeh Odeh, 32, a surgeon at St George’s Hospital, Tooting, who witnessed the aftermath, said: “I saw a mangled bicycle lying in the road with a body next to it. It was a horribly graphic scene – many people were staring in shock. It is not something you ever expect to see. In 2006, Emma Foa, 56, died after her bike was in collision with a cement mixer lorry at the same junction. [Slightly incorrect: it was nearby, at the junction of Goodsway and Camley Street]. Cyclist Madeline Wright died in 2007 near King’s Cross Station after a collision with a lorry. The spokesman said it was the 13th cycle death in London in 2011 compared to 10 last year. As the TfL spokesman says, more certainly "needs to be done to prevent serious harm befalling London's cyclists". There are clearly massive problems at the major junctions around all London's main rail stations for a start. These are places lots of cyclists go. We needs an urgent, concrete and comprehensive action plan to tackle these. Not more contemptible weasel words from TfL about "balancing" or "reflecting the needs of all road users". Why do we make no progress on the issue of lorries and cyclists in London down years and decades? As I have said before, it is because we have a hold of the wrong end of the stick. The (main part of the) answer is not educating lorry drivers and cyclists to be better aware of one another. It is separating cyclists and heavy vehicles, whose drivers can't necessarily see them, by design. Designing so that drivers and cyclists don't take risks, or when they do take them, the consequences are slight. Prioritising the movements of pedestrians and cyclists. The Dutch concept of sustainable safety. It gives two pictures, on one side TfL want to make the traffic flow for motorised vehicles as quick as possible, but on the other side they want to get people out of their cars and onto the streets which they have just put fast-moving and dangerous traffic on to. I think, unfortunately, this scheme could work. People are quite inclined to accept material inducements to do dangerous things, particularly in difficult times. We'd better get ready for more tragedies. 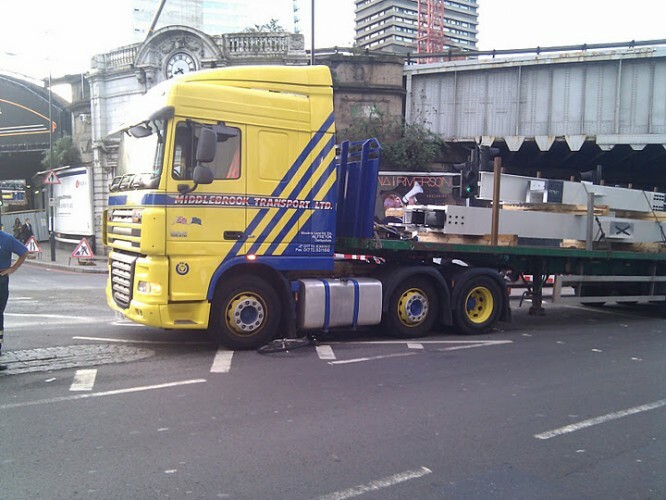 HGV drivers definitely need to go through more rigorous checks and repeat them every year to ensure they are still fit to drive. Take a look at this sad story - killed on a beautiful sunny weekend by a geriatric driver! Sorry, the facts are against you. We've seen enough cases where the system went wrong. It isn't rigorous. For example, the case of Barry Meyer, jailed for causing the death of Alan Neve, who had been banned from driving five times, for drunk driving, driving without license etc. yet was still employed by a company to drive a tipper truck in the middle of London. When I am cycling I am rarely 'angered by lunatic cyclists I see'. In fact I rarely see any other cyclists at all. I am constantly angered by motorists I see taking risks with my and other people's lives. I suggest you have a skewed perception of the situation. However, none of this anger gets us anywhere. A general theme of this blog is that we cannot depend on training of drivers or riders, no matter how good or rigorous it is, to protect the vulnerable on the road. People always make mistakes. Cyclists need to be separated from dangerous vehicles, structurally, by having their own protected spaces, as we are increasingly seeing now in London and other cities (but did not have in 2011, when this blogpost was written). You are quite right about the importance of separation. When I'm driving, I do my best to follow the highway code, so when I pass bikes, or they pass me, no problems arise. Little or no inconvenience to me, and no danger to the riders (although mistakes are always possible). But on the motorway I often see HGV drivers aggressively tailgating or weaving between lanes. It's strange that Kev hasn't seen it too.